Our objective is for you to be successful in growing our plants. Here you will find the the growing advice you need to be successful. Some growers are shifting to benchgrafts as their source of fruit trees for planting and replanting orchards. Cost is certainly a factor in their decision, however like in most things what is gained is balanced by increased risk. Benchgrafts as a general rule are more tender and fragile than a 2 year old tree from the nursery. Your success is very dependent on your management and the weather. The graft union on a bench graft is only partially callused at planting time and is physically weak relative to the rootstock and scion. A light frost will kill cells at the tender union so don't plant until there is no chance of frost. A 5% loss is common and you shouldn't plan on a 100% take. If we plant grafts to produce nursery trees we plant 15% extra anticipating loss in the production process. 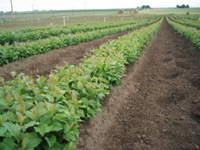 Growers should plan accordingly and order 15% more grafts than the planting requires. If you begin to see survivability problems in your benchgraft plantings shortly after planting, call the nursery immediately to help manage and mitigate the problems. The following recommendations will help you improve tree survivability in your planting. Do not touch the graft, except below the graft union, until late May or until you have 3" of growth. Many grafts are lost at planting due to workers holding the grafts from the top and breaking the developing callus. Even brushing against them or tripping across a row can break many grafts. This happens easily and often remains invisible due to the tape and wax covering the unions. Begin an aggressive mildew program at planting time. The stress of healing the graft seems to make them more susceptible to mildew problems. Adding some urea to each mildew spray may help with leaf size and vigor. Plant benchgrafts with a shovel. Although benchgrafts have been successfully planted with machines the weaker graft union structure will contribute to more breakage potential. Plant benchgrafts when the buds at the top of the graft stick begin to swell. We ask that you give us a target planting date. We will warm up your grafts with that target in mind. Understand they may be ready a few days before or after your target, but they should be planted when they are ready, so please try to be flexible. Site preparation is important. We recommend pre irrigating the soil or at least getting moisture to the roots within 24 hours of planting. Irrigation management is probably the most critical issue in establishing an orchard of benchgrafts. The root zone cannot dry out. In most cases a rollout drip system for 1-2 years will pay for itself in surviving trees and tree growth. We recommend using grow tubes. The graft union is tender and the heat generated inside the tube promotes callusing and protects a little from dehydration. Grow tubes also help protect from weed sprays. You can remove the tubes at the end of the first growing season. The type of grow tube is to some degree irrelevant but ones that incorporate a bamboo stake that allows you to slide the tube up and down the stake will make rootstock suckering during the summer easier. The protected area inside the grow tube is also a great place for pests, particularly cutworms, red mite, and mildew. Use a control method several times a season that gets the material down inside the tube. If all buds are pushing at the same time and all are 1" long, then strip the rootstocks only. When shoots on graft scion are 3-4" long thin to the two best ones. When the strongest shoot is 4-5" long thin to the best one. Keep the rest of the plant stripped as the root shank my keep trying to sucker through the year. Around July 20th cut the stub of the scion off so the wound has time to heal and it will not desiccate and cause other problems. If the scion stick is slow to push but the rootstock is pushing profusely then thin the root suckers to the highest, strong shoot. If the scion never pushes adequately then bud the stock in August. By the time the scion is 12" you will likely have made four to eight total passes. The rest is obvious: keep one leader, remove low branches, and always watch for mildew. Click here for PDF version of these instructions.